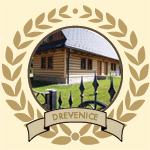 The accommodation we provide in our traditional log cabin suites is referred to as “Šarišská dedina” (“The Šariš village”). The six suites in the three log cabins ensure sufficient privacy as well as opportunities to take advantage of the whole range of services on offer at ŠARIŠ PARK. The suites are equipped with natural wooden furniture designed in the style of traditional Slovak smithery and woodworking. The unforgettable atmosphere of the log cabin suites reminds visitors of traditional Šariš village houses. Each of the two-storey suites has a separate entrance door. There is an entrance hall and a spacious living room (here, two extra beds can be optionally arranged) on the ground floor, and a couple of bedrooms on the first floor (each equipped with two beds). Interestingly, three of the log cabin suites have a fireplace. Moreover, one of the suites is adjusted to the needs of persons with physical disability. Naturally, each of the six suites includes a spacious bathroom, complete with a toilet, shower cubicle, hair dryer and hotel cosmetics. On the other hand, the living-room area is equipped with a telephone set and an LCD television set connected to a satellite dish. Each of the six maisonettes has a floor space of 90 square metres and offers free parking space at the front. The “Šariš village” complex is about five minutes’ drive from Prešov and sleeps up to 45 persons (33 standard beds plus 12 extra beds). Should you prefer modern designs, our 3-star Guest house offers a spacious suite, a family room with three beds, five rooms with double beds, and four rooms with single beds. The suite has an entrance hall, a lounge, a bedroom, a bathroom, a separate on-suite toilet, and a mini bar. Both the suite and the rooms of the Guest house feature a modern design and provide comfortable accommodation, complete with LCD television sets with satellite reception, separate bathrooms/toilets, hair dryers, hotel cosmetics, and telephone sets with direct dialling. The total capacity of the Guest house section is up to 30 persons, i.e. up to 22 standard beds and up to 8 extra beds. In total, the building can sleep up to 75 persons (55 standard beds and up to 20 extra beds). Each of our rooms and suites has an on-suite bathroom and a terrestrial and satellite television set (4 channels). In addition, our guests can enjoy free Wi-Fi Internet access anywhere on the premises. On request, a couple of toddler beds are at our guests’ disposal. The Guest House is about five minutes’ drive from Prešov in the direction of Sabinov. There is a spacious car park suitable for coaches and drivers with physical disability. 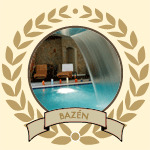 In 2010, ŠARIŠ PARK came fourth in the TREND 2010 Top Restaurants and hotels in Slovakia list of guest houses. Total capacity: 75 persons – 55 beds a 20 extra beds.